Begonia 'Santa Cruz Sunset' (Begonia boliviensis 'Santa Cruz Sunset'): growing, planting, caring. 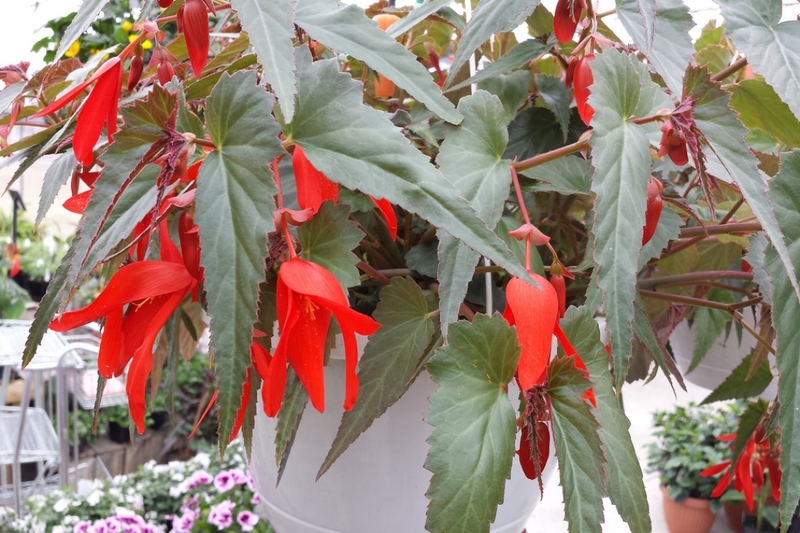 Hybrid Begonia grown as an annual, with hanging gorgeous red flowers. This hybrid exists since 2011, it is know for being resistant to all summer weather conditions - drought, rain, sun. It holds large bright red hanging flowers and elongated, dark green, asymmetrical leaves with dentate rim. These begonias are mainly grown in pots or planters, because they must absolutely be protected from frost in winter. If you want flowering begonias in May - you'll need to sow in february - in a heated room (20°C +). Begonia seeds will require light - don't dig them too deep under the surface. Note that you can also sow outdoors, when the earth level reaches a good 20°C - and you'll have begonias later in the season. Two to three months after sowing and after the last spring frosts, the seedlings have grown strong enough to be placed in the ground. It is more or less in this condition that you may buy potted plants. Choose a location that is slightly sunny or even partial shade. Plant in a "bed" worked finely (dug, scratch then rake). Once the board is properly prepared, simply make a small hole with a transplanter. Remove the plant from its bucket, put it in the hole, and compact the soil to put it in contact with the roots. Respect a spacing between the plants corresponding to one third of its intended width. Water copiously to facilitate rooting. Choose a location that is slightly sunny or semi shady. Plant them in "your future massif of flowers" worked finely (dug, scratched then raked). Once the board is properly prepared, simply make a small hole with a transplanter, remove the plant from its bucket, put it in the hole, and compact the soil to put it in contact with the roots. Respect a spacing between the plants corresponding to one third of its intended width. Water copiously to facilitate rooting. It may seem silly to say, but you must remove the annual plants at the end of the season! So how to do it? It's simple: for plants with superficial rooting, just unroot it by taking it from the base. Otherwise help yourself with a spade. You can choose to put them back in pots, taking out the whole clod (without breaking or cracking it, if possible) using a spade. It will then be necessary to shelter the pot during winter. Begonias multiply mainly by sowing. Remember to harvest the seeds in late summer to sow them under cover from February-March. After sowing: Plant the seedling between two and four weeks after sowing (as soon as the plant is sufficiently developed to be handled). Separate carefully the seedlings and transplant individually in a bucket filled with transplanting soil, or a mixture of soil and well-decomposed compost. Water copiously at the plantation, then regularly during the first weeks to keep the soil moist. For plants of one year or more: If you have managed to keep your begonia for several years in pots, repot it after two years in a larger container. Scrape the outside of the clod to aerate it, then transplant it in a mixture of fibrous compost or potting soilt with some loam. Sprinkle. Your begonia will be very happy outside on sunny days! Acclimate it little by little by putting it gradually in the sun.